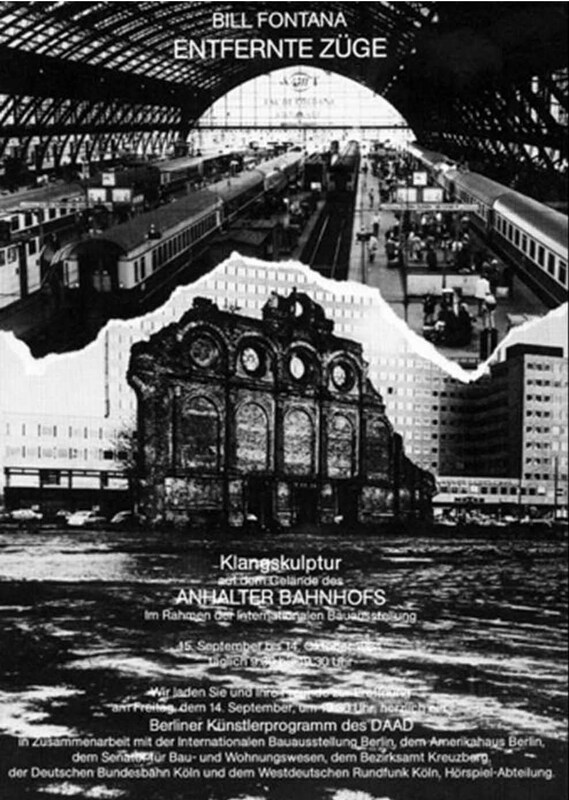 This sound sculpture was installed in the large empty field of what had been one of the busiest train stations in Europe before the war, the Anhalter Bahnhof. Loudspeakers were buried in the field and played sounds of the Köln Hauptbahnhof, the busiest contemporary European train station. Live microphones were placed in 8 different locations in the Köln Hauptbahnhof, so that the acoustic space of this large station was reconstructed in Berlin. "For Fontana, such historical sites have their own memory, resonating throughout the solid material of the site–its ground, walls and ceilings." "Bill Fontana’s creations are not a revolutionary stride in the development of music. Rather do they revive - if not bring to live - a nearly related branch of art that could only truly develop through the invention of recording and electronic sound production."